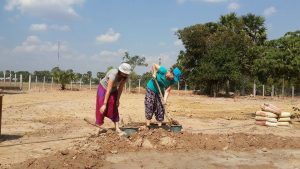 Volunteer in cambodia: Come and help us now! 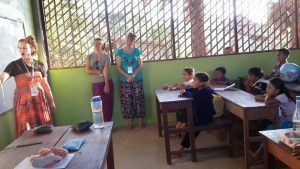 Upon volunteering in our village school you will learn about our culture while sharing your knowledge and skills. We welcome all visitors to our school, but a stay of one week minimum is preferred. You can share your skills while teaching English, computing, sewing and gardening. Let us know how you would like to help. 165 US$/person/week/private room. 155 US$/person/week/shared room. 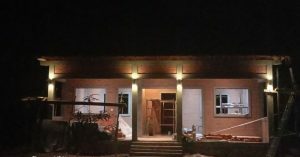 Our new accommodation building is currently under construction (estimated completion date May 2019). This building includes a shared bathroom and a western style toilet. Simple meals 3 times a day are included. (No soft drinks or alcohol). Seasonal fruits only. Roundtrip from Siem Reap to our village is not included (about 1hr drive by taxi; 1.5 hr by tuk tuk. Bus is a bit longer). Minimum stay 2 weeks (so all children get to know you and feel comfortable). We can organise a cultural tour of the area. Check with us for prices and possibilities.